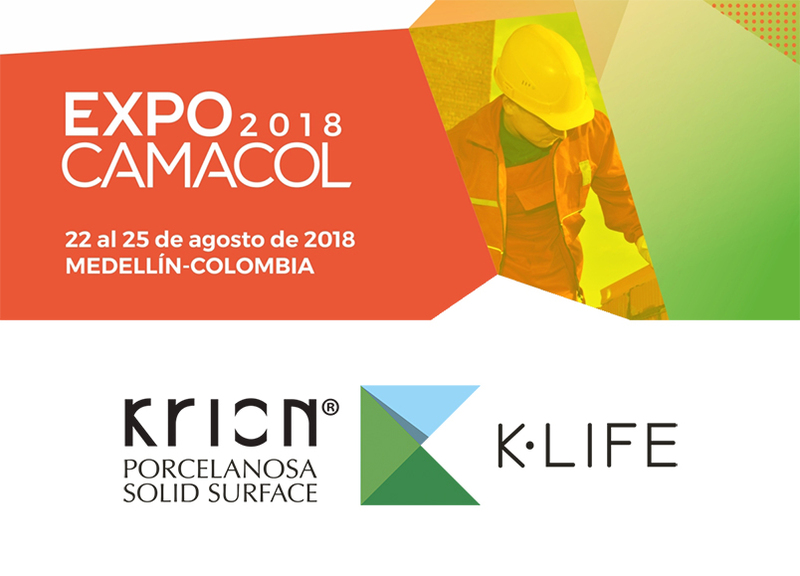 KRION® was present at EXPOCAMACOL, the international industrial and construction trade fair held in Medellín from the 22nd to the 25th of August 2018. The K·LIFE offered a great sensory experience at the KRION® Stand, where all benefits provided by this exclusive material were also presented. At one of the most important events of the sector in Colombia, where business sectors and professionals came together to combine trade, new products and business related with the construction production chain, KRION® was present, exhibiting the compact material as an excellent raw material for undertaking a multitude of projects. KRION® participated in this edition with an impressive Stand, exhibiting all features of the product. Additionally, the K·LIFE sensory experience, installed in the same space, was one of the most prominent features of the event. At Stand 25, the revolutionary material, which adds four exclusive beneficial properties to KRION®, demonstrated a sensory experience with a moving video and a thorough presentation which, in a short time, showed the public the serious environmental problem that we face with pollution, and how K·LIFE, with its KEAST® technology, helps to purify the air and eliminate many of the harmful compounds, thereby helping to create healthier surroundings. At a trade fair for architects, engineers, technicians, businesspeople and builders, among others, over 450 exhibitors from 21 different countries participated, visited by over 58,000 attendees over the 4 days they were open to the public. With over 24,000m2 and a total of 4,000 commercial actions between exhibitors, dealers and visitors, the event proved to be a true success, and it is hoped that these spectacular figures will be surpassed in future editions. The scope of the new products and launches of the industry were disseminated through international coverage by over 95 accredited media outlets.